The rise in so-called insider attacks by rogue Afghan security forces has highlighted the perils of joint operations in counter-insurgency. But former US soldier David Donovan, who fought in Vietnam, says lessons learnt long ago have been forgotten. If you could feel the heat and sweat of the tropics. If you could hear the noise of battle and sense the fears. If you could put yourself on the other side of the world where you are the selectee of your government to advise and help a unit of foreign fighters defend their village. And if you and that unit are at this moment in combat but they are being slow to react, you might come close to understanding how I felt one day in 1969 in the Mekong delta of Vietnam. The enemy were in a nearby tree-line. They had taken us under fire, and bullets were cutting leaves from the trees. We already had wounded - one man shot in the foot, another in the side. 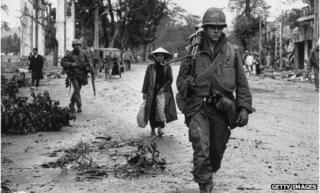 Everyone had gone to ground and the Vietnamese officer, my counterpart, was down behind a small dike with some of his soldiers. He was fixed in place, not taking the lead. I was an American infantry officer there to provide assistance when possible and leadership when necessary. Frustrated at our slow reaction, I ran toward my counterpart intent on getting him to lead his men. But as I made my way, a background programme had already begun running in my mind. It asked, "What are you doing here? Is this ever going to mean anything?" David Donovan is the pen name of scientist Terry T Turner, of the University of Virginia. He served in the US army from 1967 to 1970, and saw frontline action in Vietnam. He has written a number of books about his experiences there. I was in Vietnam because the United States had decided to assist an ally in fighting an insurgency stimulated and supplied from across international boundaries. The rights and wrongs of our intervention were a matter of vigorous debate, but that debate was not mine. I was an Army officer trained in counter-insurgency and I was in Vietnam to lead a small advisory team in a remote village near the Cambodian border. We were doing counter-insurgency focused on two things - improving village security and encouraging local development. Improving security meant improving the fighting skills of the local militia. They were poorly equipped and poorly led, neither of which helped morale. Improving their fighting skills meant going into combat with them, fighting beside them and learning first hand what it means to fight a guerrilla war. Encouraging development meant helping local officials initiate projects meant to improve community life. The main enemies to security were the local guerrillas. The main enemy to development was a corrupt bureaucracy. We finally made our assault that day back in 1969. When my counterpart proved hesitant, I knew the leadership had fallen to me. I signalled to my US teammate on the operation that we were moving out. Then he and I, waving and shouting at the others, began a manoeuvre against the enemy's tree-line. The unit followed our lead, but our delay had allowed most of the enemy to slip away. It was not an uncommon result, the reasons for which are complex and range from the military to the religious and everything in between. That is why counter-insurgency is such a complicated task. So you might imagine my concern during the past decade as my country has made its way into two counter-insurgency wars at the same time and has bumped first into one problem then another. Our ineptness at the enterprise has been frustrating because the difficulties reported have seemed so predictable. Operations are in transition between counter-insurgency and a training and mentoring role. I know what it means to do counter-insurgency. I know what it means to do war in the village, and I know from the outside looking in how large US units, simply because of their size and American nature, can perturb a local culture and make friends into enemies without really meaning to. And counter-insurgency is not won by firepower alone. It is won by a government attracting the loyalty of its own people. If Vietnam taught us anything, it is that we can help an ally do that, but we cannot do the job by ourselves. The host government has to be interested and active in winning that basic loyalty. Those were my thoughts in 2003, 2004 and 2005 when we had American, British and other allied soldiers fighting wars in two different countries where even the people claiming to be our friends wanted us gone as soon as possible. It didn't help that our counter-insurgency programmes seemed to lack focus. It was maddening. The US military had had decades of counter-insurgency experience in Asia, Latin America and even Europe. Where were the lessons-learned manuals? Had no-one read them? Was no-one paying attention? In 1985, I had written a book entitled Once a Warrior King about my experiences in Vietnam. On the basis of it alone, in 2006 I was invited to attend an Army conference where then Lieutenant General David Petraeus was commanding. The conference was on the training of indigenous forces by US advisors, but the related issue of counter-insurgency also came up in discussions. The conference was interesting but disheartening. It became clear from the presentations that many of the lessons learned in Vietnam and elsewhere had been lost from our institutional memory. General Petraeus acknowledged that and said the loss had occurred in the 1990s as the US military had been rebalanced after the collapse of the Soviet Union. Those old lessons were still having to be relearned in Iraq and Afghanistan, he said. That was hard for former advisors to hear. Lessons and principles that should have been learned, partly from our own sweat and blood, had been discarded like a pair of old shoes. So what are those lessons? First, ask questions before you get involved - and hear the answers unfiltered by political agendas. From the US perspective, the leading question ought to be, what are the American interests in the host country and are they sufficiently vital to require American action? South Vietnam eventually fell to North Vietnam, but with no consequences to us other than the high price we had paid to help a friend who in some ways would not be helped. Another question - what is the level of internal support for the host government? A narrowly-supported and entrenched oligarchy does not bode well for a counter-insurgency effort. On the other hand, entrenched and unpopular does not mean irremediable. So the next key question is, what is the host government's willingness and ability to make the changes necessary for winning the loyalty of its people? Without that, no counter-insurgency programme will succeed - and this is an important point because it is aimed at preventing Saigon Syndrome, that condition wherein the strong are pulled down by the weak. The heaviest drag downward is government corruption. It is a cancer that destroys from within. In Vietnam, corruption meant, among other things, that officials would buy or sell government jobs, peddle influence or divert procurements for their own profit. Such practices devalue a government in the eyes of its own people and in that way actually feed the insurgency. So what has come of our more recent counter-insurgency efforts? Not much, I fear. Our military is now out of Iraq, but in that stew of government obliquity and secular animosities, no claims of success can be made until we know what kind of government survives in the long run. The possibilities there remain troubling. What lies behind insider attacks? In Afghanistan, the war continues - but that is a place of even lower promise. The Afghan government remains famously corrupt and appears either unwilling or unable to make changes. Some allied officials have tried to dismiss corruption as a cultural matter and in that way deflect calls for action. That is a mistake. Ignoring corruption now only means the Afghan government will suffer for it later. Its people will remain disaffected while its enemy operates with two strong motivations - religious fervour and ethnic xenophobia. The mullahs in the hills and valleys declaim against our presence today exactly as they did against British forces a century and a half ago. I hope I am wrong, but I fear things will not turn out well. It is hard to escape the adage that the main thing we learn from history is that we don't learn much from history - and those old questions from 1969 come to mind again. What are we doing? Is it ever going to mean anything? Listen to David Donovan read his essay on the BBC Radio 4 Broadcasting House programme website, or download the podcast.